I just found this great lamp. I walked into the used furniture place and it screamed my name the minute my foot was inside the door. I'm quite aware of why this happened. I recognized it as a woven backpack from the Philippines. As a matter of fact, I have one already only it's bigger. I bought it in a street market in Bagio. It's about 50% bigger and I can actually wear it. The backpacks are made by the indigenous tribes. They are a fascinating people to look at: tiny, lean, fine features. 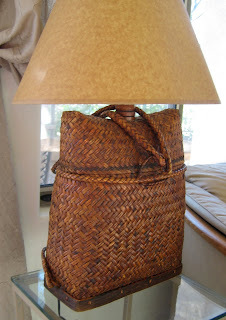 Anyway, it had crossed my mind to make a lamp out of the basket, but I just couldn't bring myself to alter it in any way. So now, it can be a companion to the lamp. Having made a few baskets myself, I have a weakness for any that are well made. The more knowledge you have of something, the more you can appreciate it. 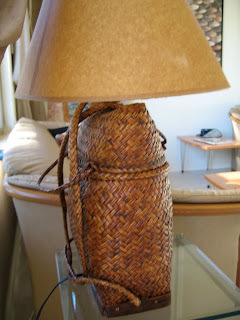 The weaving is amazing; what a beautiful lamp; love the texture. when I was decorating my home I read somewhere that decorating should include texture as well as form and color, the basket lamp is perfect for that. I love shopping in used and thrift stores as I am always impressed at the appreciation that others had for an object and am happy to appreciate it again. in my backpack days i would have appreciated a woven backpack.